Another New York City nightmare came true on Sunday afternoon. 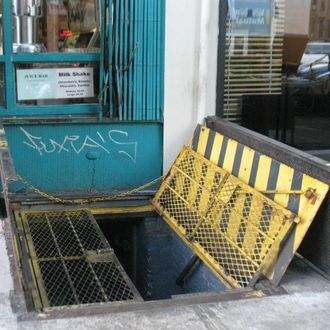 The New York Daily News and DNAinfo report that a 30-something man died after falling through a cellar door on a Bed-Stuy sidewalk. He landed in the basement of an abandoned building at 1281 Bedford Avenue, where he was pronounced dead. “The thing just opened. He was walking. He wasn’t paying attention. The thing is loose. And he disappeared,” said a witness. Be careful out there.